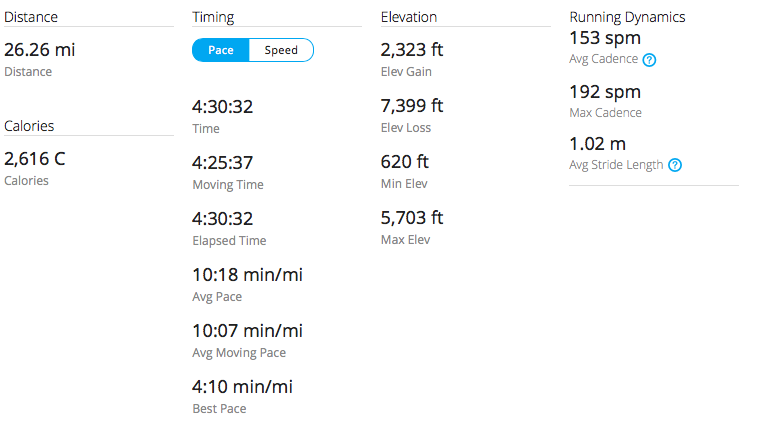 I am now three days post marathon and while I was fairly quiet about doing Revel Canyon leading up to it, I decided that after running that course, that I will NOT be doing CIM ( California International Marathon​)this year. I just deferred the 2015 race to 2016. My decision was based on the extreme forces that were put on my legs running Revel. I would not be able to recover quickly enough to “race” CIM the way I want to. Even if I ran CIM for the miles, I fear that I would risk injury. I have learned that no medal is worth the injury or the potential for injury. I know my body well enough that I really think that this emotional decoupling and ability to pull off this race was the best for me and my running future. I will be running the Berkeley Half marathon as my last big race of the year. I will run a small 5k on Thanksgiving morning with my children. I will not be toeing another line until March. Berkeley will be run at a nice, gentle pace as I will only be two weeks post Revel. In December, I will ease back into training again for my favorite full marathon, the Napa Valley Marathon​. I will “race” Napa. There are only two marathons that I attempt a PR or even give my all at for the hope of a BQ. They are Napa and CIM. My body needs the gentle downhill course with the softer rolling hills for change in muscle work. I also need the cooler temperatures as I do not do well at all in temps higher than 65 degrees. Napa and CIM offer exactly the perfect environments for me to do what I think, is my best work. I post this because it is important that you give yourself the chance to heal when you need to. I am here to validate you. I am also posting this because this is advice I would give to anyone. This is my attempt at leading by example. To say that I am very disappointed in my results at Revel is an understatement. I trained very hard on this last training cycle for this race. My paces were where they needed to be for a PR and even if lucky, a BQ. I left that course without even as much as a PR. But, I am proof that regardless of how hard you train and regardless of what your watch says, if the body does not want to work, it won’t. Running Revel sick was not my intention, obviously. But it happened. I rallied and I did not give up. I had no idea that I would be dealing with a 2K+ gain either – that was a game changer. That mountain was a beast and I gave it everything I had. Believe me, I have been through so much more in my life – that mountain did not beat me – I still got off it and I got the earned medal to prove it. I also know that it may not be my race to run again. Does that make me miss out on a possible chance for a PR or a BQ on that course in the future? Maybe. But, I know beyond a doubt that I now know what my body can tolerate and what it can’t on a course. Maybe all is not a loss. Maybe I gained Personal Reflection (my new PR) on that course. Maybe it is true after all, every race you learn something different about yourself.